The S31 is now the bigger version of the S21. The S31s expanded work surface offers 10 additional faders for more control and two other multi touch screens for faster access and more visual feedback. Ideally suited to applications where more instant control and feedback are critical to the operator. We at DiGiCo also know that many engineers like to keep their VCAs separate; this is now easily achieved, without compromising your preferred workflow with the option of dedicating a section to your VCAs. Naturally these faders are in groups of 10, so there's plenty of space to build a full production: why not layout a whole drum kit on one bank, an entire strings section on the second, and the band on the third? It just makes everything that little bit more accessible. The new look screen designs are all developed under the flat designs philosophy, to aid the user learning curve and take away distraction from an operator. 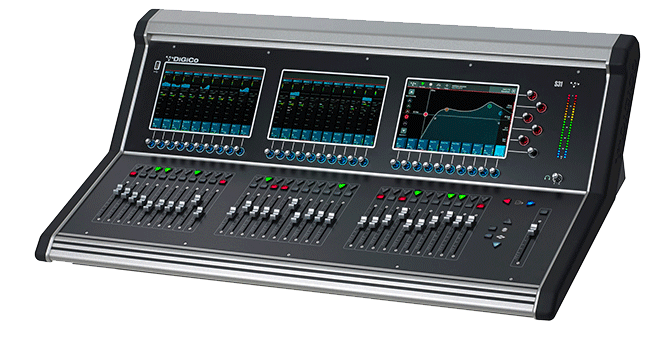 These new designs will still be familiar to existing DiGiCo users, but allow new operators to feel at home and ready to take advantage of the wealth of integrated processing. Channel Bank Layout: as with all DiGiCo products, you can alter where the banks are located, and mix and match any channel, aux, group, control group, or matrix within a bank, with the ease of drag and drop, at the touch of a screen. S31 comes complete with dual DMI (DiGiCo Multichannel Interface) option card slots, perfect for expandability, as it can interface with industry formats be it Analogue expansion, MADI, Dante, Waves SoundGrid, or Calrecs Hydra 2 Network. All bases are covered.